4 stars! "Cemetery of Splendour explores our sleeping and waking minds"
“A farewell letter to Thailand.” That’s how Apichatpong Weerasethakul describes his spellbinding feature film, Cemetery of Splendour, set in his hometown of Khon Kaen." "a mystifying and wondrous experience." "intriguing, captivating and rich in dreamy thoughts with a touch of humour." 4 Stars! "a haunting film with hypnotic effect. It will make you to watch it with eyes wide open"
"moments of swooning beauty and unexpected comedy"
"another sublime effort from one of the best filmmakers working today"
"It was my first time watching a Weerasethakul film and if anything, it is a gift for someone who loves film that experiments with the medium in an almost spiritual way." "24 hours after an initial viewing, individual shots — none of which are wasted, even as Splendour becomes a tad less intriguing in regards to the conflicts within them — stick in the brain, each creating an association with another, and another, and another. I remain content with luxuriating in them, their overwhelming soundtrack, and the singular sense of vision that makes nearly everything indispensable; it’s okay to delay ineffable matters when there’s little reason to believe they’ll drift away." "CEMETERY OF SPLENDOUR wants to take the serenity of unconsciousness and put it on the screen, and to that end the film is a success." "You drift between wakefulness and somnolence, sucked in by the mesmerizing, languid rhythms lapping against the outsides of your eyelids. You’re drawn deeper, deeper … deeper still, deeper into the cinema." "resonates deeply as a movie made by someone with total command of his form." "Definitely for art house fanatics, and it’s absolutely made to be watched in a cinema where the colours and sound design will be best represented." 3.5 stars out of 4 " a film that feels like a true meditation – on life, death, past, present, religion, spirituality: essentially, the building blocks of our common humanity." "mystical, hilarious and eerie and centred by a staggering performance by Jengira Pongpas Widner"
"Cemetery Of Splendour is cinematic poetry in storytelling." 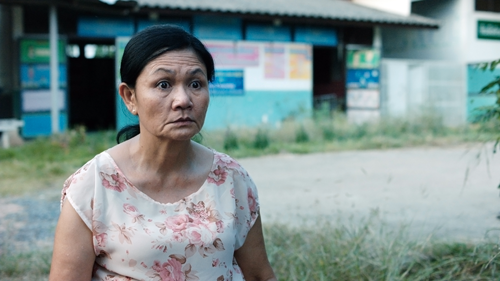 "CEMETERY is funny, very subtly political and typical Apichatpong Weerasethakul"